When you trust Nelson Tree Specialist to come and look after your trees, you’ll learn a thing or two about how to properly take care of your tree. When you start trimming your trees, you must realize that it’s not always easy. Luckily, we have some helpful tips to make sure that you do this correctly. Trimming your trees however you feel is best is not the way to go. Unlike bushes or other plantings around your home, trees must be trimmed in a very careful way. Spot any dead wood on your trees and take care of that first. Then, carefully select the other branches and twigs you want to remove so you don’t endanger the health of your tree. Trimming your tree as a way to relax after a stressful day isn’t recommended, either – you should always pay attention to what you are doing as you do it. Unfortunately, if you don’t trim your trees in just the right way, you could be exposing them to disease and other causes of their health declining. There are parts of the tree that you can’t see just looking at it – people have a circulatory system that sends oxygen and nutrients to different parts of the body. 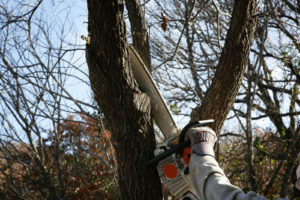 Trees do too, so you need to recognize any potential hazards that might pop up when you go to trim your trees – you don’t want to get hurt, but you don’t want to injure your trees either. When you need it, don’t hesitate to get some expert advice. When you trust Nelson Tree Specialist to come and look after your trees, you’ll learn a thing or two about how to properly take care of your tree. Although you might be up to the task physically speaking, being able to do this requires some professional expertise, too. To help make sure your trees last longer, don’t try to do it all by yourself. This entry was posted on Friday, May 18th, 2018 at 2:32 pm. Both comments and pings are currently closed.